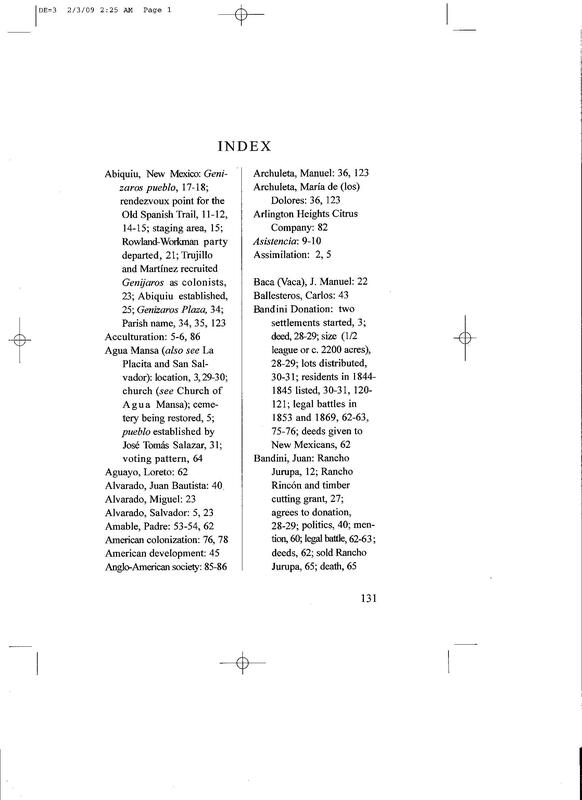 Click index to review a detailed bibliography of former editions of Spanish Traces. 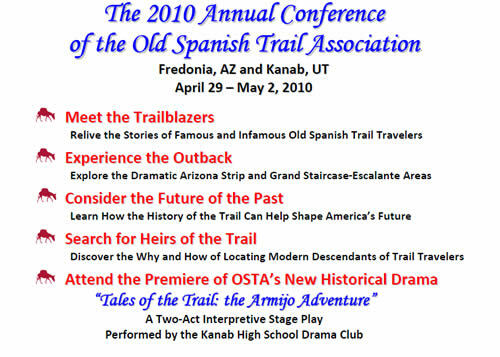 Old Spanish Trail Association members gain access to the complete content of Spanish Traces (see membership tab for additional information). Click annotated bibliography to review California settlers who emigrated via The Old Spanish Trail (courtesy the personal collection of Donald E. Rowland). 1963 “Fray Silvestre and the Obstinate Hopi.” New Mexico Historical Review XXXVIII:2 (April 1963):97-138. 1989 Man, Models and Management: An Overview of the Archaeology of the ArizonaStrip and the Management of its Cultural Resources. Report prepared for USDA Forest Service and USDI Bureau of Land Management by Statistical Research, Plateau Archaeology. Tucson, Arizona: Dames & Moore, Inc.
1941 “Old Trails, Old Forts, Old Trappers, and Traders.” Utah Historical Quarterly, Vol. IX, Numbers 1-2 (January and April 1941). 1990 “Fort Uncompahgre.” In The Silverton Standard and The Miner. Silverton, Colorado. 1886a The Works of Hubert Howe Bancroft, Volume XXI, History of California, Vol. IV, 1840-1845. San Francisco, California: The History Company Publishers. 1886b The Works of Hubert Howe Bancroft, Volume XXII, History of California, Vol. V, 1846-1848. Santa Barbara, California: Wallace Hebberd. 1988 North American Terrestrial Vegetation. New York, New York: Cambridge University Press. 1987 Las Carneradas: Sheep Trade in New Mexico, 1700-1860. Albuquerque, New Mexico:University of New Mexico Press. 1978 “Serrano.” In Handbook of North American Indians: California, Vol. 8. Robert F. Heizer, volume editor. Washington, D.C.: Smithsonian Institution. “Land of the Blue Sky People.” In The Monte Vista Journal. Monte Vista, California. 1939 Heritage of the Valley: San Bernardino’s First Century. Partial copy. Pasadena, California:San Pasqual Press. Topographical Engineers.” In Reports of Explorations and Surveys, to Ascertain the Most Practicable and Economical Route for a Railroad from the Mississippi River to the Pacific Ocean. Made under the direction of the Secretary of War, in 1853-4. Volume 2. Washington, D.C.: A. O. P. Nicholson, printer. 1982 Westward Expansion: A History of the American Frontier, 5th Edition, New York: Macmillan Publishing Co., Inc.
1931 Zealots of Zion. Philadelphia: The Penn Publishing Company. 1965 The Old Trail to Taos. New Mexico Magazine 3, March 1965: 33. 1975 Mexico Views Manifest Destiny, 1821-1846: An Essay on the Origins of the Mexican War. Albuquerque, New Mexico: University of New Mexico Press. 1969 A Ride With Kit Carson Across the Great American Desert and Through the Rocky Mountains. Palo Alto, California: Lewis Osborne. 1985 What I Saw in California. Reprint of 1848 book. Lincoln, Nebraska: University of Nebraska Press. 1973 “Point of Historical Interest, San Bernardino County, Pozos de San Juan de Dios (Marl Springs).” Site form on file at the San Bernardino County Museum, Archeological Records Center. San Bernardino, California. 1970 “Camp El Dorado, Arizona Territory.” Volume Number 2, December 1970. In ArizonaMonographs. Tempe, Arizona: Arizona Historical Foundation. 1986 The Mojave Road Guide. Norco, California: Tales of the Mojave Road Publishing Company. 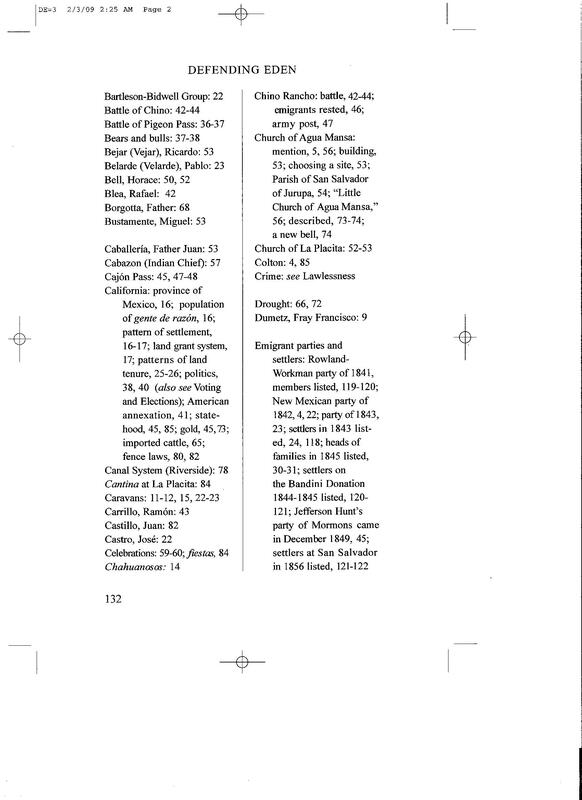 1976 The Domínguez-Escalante Journal: Their Expedition through Colorado, Utah, Arizona, and New Mexico in 1776. Provo, Utah: Brigham Young University Press. 1998a Personal Communication to Larry Beal and Diane Rhodes (with marked-up Gunnison River Bluffs Trail brochure). 1998b Historic Trails Through the Grand Valley of Western Colorado. Prepared for the Colorado Riverfront Foundation under a grant from the Colorado State Historical Society. Grand Junction, Colorado. 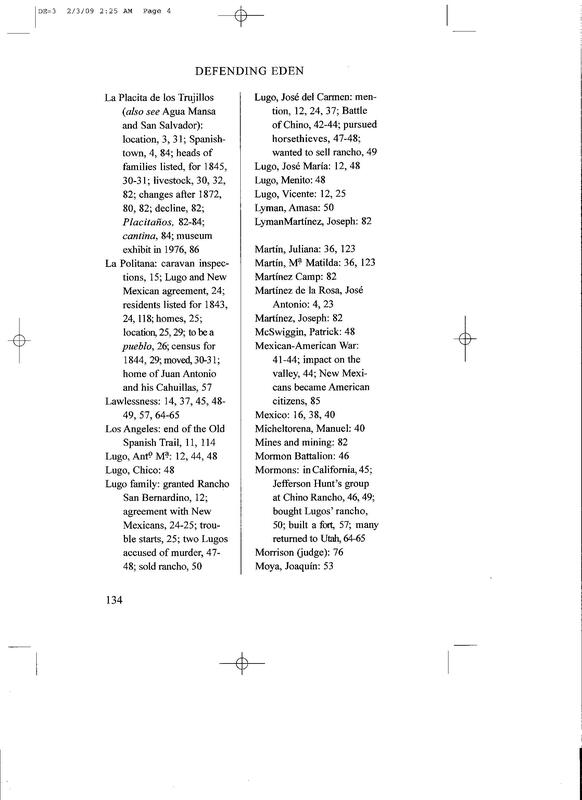 1999 “Military Use of the Old Spanish Trail, including the North Branch, 1844-1860.” In Spanish Traces, Vol. 5, No. 2, fall 1999:26-31. 1914 “The Early Sentiment for the Annexation of California: An Account of the Growth of American Interest in California, 1835-1845.” In The Southwestern Historical Quarterly, XVIII:1 (July 1914):1-40.
no.date. Marked-up U.S.G.S. topographic maps, map drawers, Crampton Collection, Accession No. 727, Mariott Library Manuscript Division, University of Utah, Salt Lake City, Utah. 1994 In Search of the Spanish Trail: Santa Fe to Los Angeles, 1829-1848. Salt Lake City, Utah: Gibbs-Smith. 1986 Handbook of North American Indians: Great Basin. Vol. 11. Warren L. D’Azevedo, volume editor. William C. Sturtevant, general editor. Washington, D.C.: Smithsonian Institution. 1947 “J. C. Sumner’s Journal (July 6-August 31, 1869).” In Utah Historical Quarterly, Vol. XV (1947):113-124. 1931 The Santa Fe Trail. New York, New York: Longmans, Green and Co.
Telephone conversations with John Conoboy, Long Distance Trails Group Office-Santa Fe. 1830 Registro Oficial del Gobierno de los Estados Unidos Mexicanos, “Parte no oficial, Interior,”Año 1 (Sabado 5 de junio de 1830). 1836 Diario Oficial, AGN-Numero 290, Tomo IV (Lunes 14 de febrero de 1836). 1931 Physiography of Western United States. New York, New York: McGraw-Hill Book Company, Inc.
1993 Flora of North America, North of Mexico. Vols. 1 and 2. New York, New York: Oxford University Press. 1930 “By Ox Team From Salt Lake to Los Angeles, 1850 – A Memoir by David W. Cheesman. In Historical Society of Southern Annual Publications, Vol. XIV (1930):271-338. 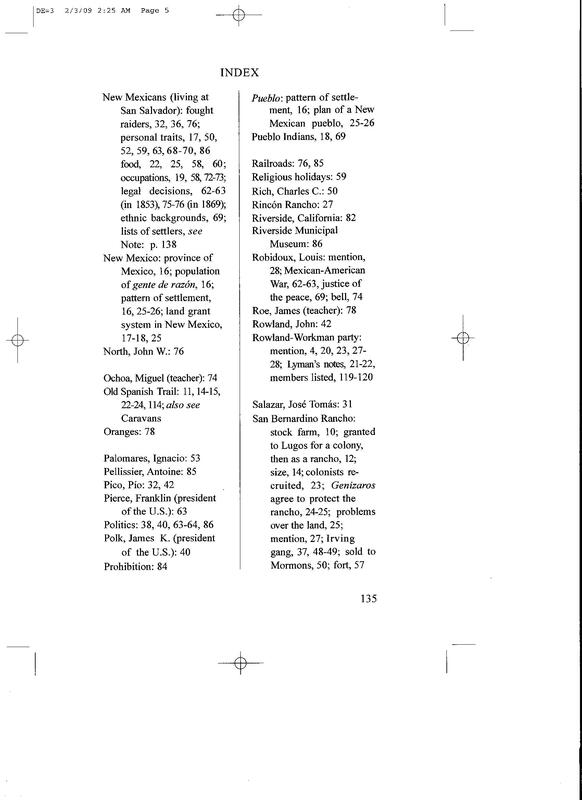 1974 Historia de las Relaciones entre Mexico y los Estados Unidos. Tlatelolco, Mexico, D.F. :Secretaria de Relaciones Exteriores. 1998 Personal communication to Larry Beal and Diane Rhodes. West. New York, New York: Alfred A. Knopf. 1959 Army Exploration in the American West, 1803-1863. New Haven, Connecticut: Yale University Press. 1949 “Journal of Stephen Vandiver Jones, April 21, 1871-December 14, 1872.” In Utah historicalQuarterly, Vols. XVI-XVII (1948-1949):19-174. 1931 The Kaiparowits Region A. Geographic and Geologic Reconnaissance of Parts of Utah and Arizona. Department of the Interior, U.S. Geological Survey, Professional Paper 164. Washington, D.C.: Government Printing Office. 1999 “Growth of Towns on the Old Spanish Trail.” In Spanish Traces, Vol. 5, No. 2, fall 1999:21-25. 1919-1922 “Bent’s Old Fort and Its Buildings.” In Collections of the KansasHistorical Society, XV (1919-1922):28-88. 1986 “Report to San Bernardino County Museum of Field Trip to Barstow Area, Nov. 103. 1986.” San Bernardino County Museum Archeological Information Center, San Bernardino, California. 1954 “Journals of Forty-Niners: Salt Lake to Los Angeles.” Edited with historical comment by LeRoy R. Hafen and Ann W. Hafen. In Far West and Rockies Series, Vol. II. Glendale, California: The Arthur H. Clark Company. Old Spanish Trail: Santa Fe to Los Angeles. Lincoln, Nebraska: University of Nebraska Press. 1948 “Armijo’s Journal.” In The Huntington Library Quarterly, 11 (1947-48):87-101. 1996 “The Agua Mansa History Trail.” In San Bernardino County MuseumAssociation Quarterly. Vol. 43(3)(Summer 1996) 1-49. The Story of Agua Mansa: Its Settlement, Churches and People. Compiled by R. Bruce Harley. San Bernardino, California: Diocese of San Bernardino Archives. 1854 Central Route to the Pacific, from the valley of the Mississippi to California: journal of the expedition of E. F. Beale … and Gwinn Harris Heap, from the Missourito California in 1853. 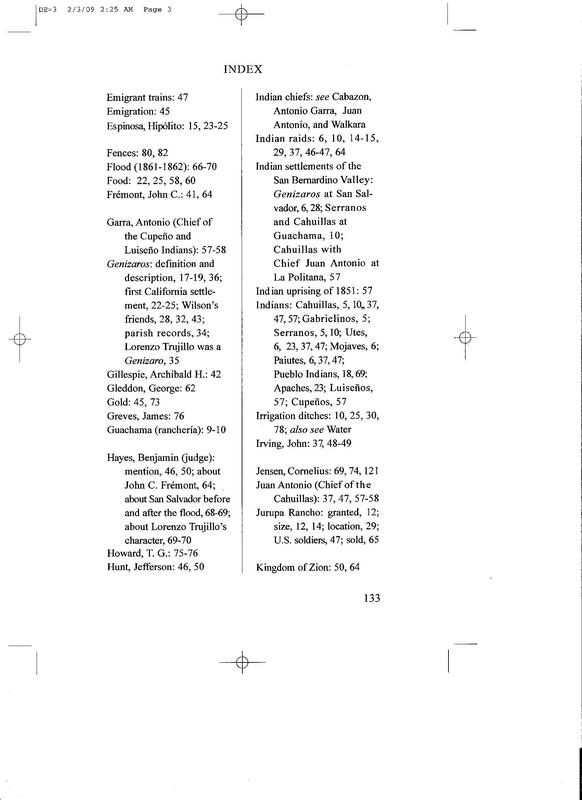 Philadelphia: Lippincott, Grambo, and Co.
“Old Spanish Trail Impacts: Timbisha Shoshone Tribe and Other Native Americans.” In Spanish Traces, Vol. 5, No. 2, fall 1999:38-48. 1921 “The Old Spanish Trail: A Study of Spanish and Mexican Trade and Exploration Northwest from New Mexico to the Great Basin and California.” In The Hispanic American Historical Review, Vol. IV, No. 3 (August 1921). “Spanish and Mexican Exploration and Trade Northwest From New Mexico Into the Great Basin.” Utah Historical Quarterly, Vol. 3, No. 1 (January 1930):223. Letter to John Conoboy, and journal article clippings from the California Historical Society. 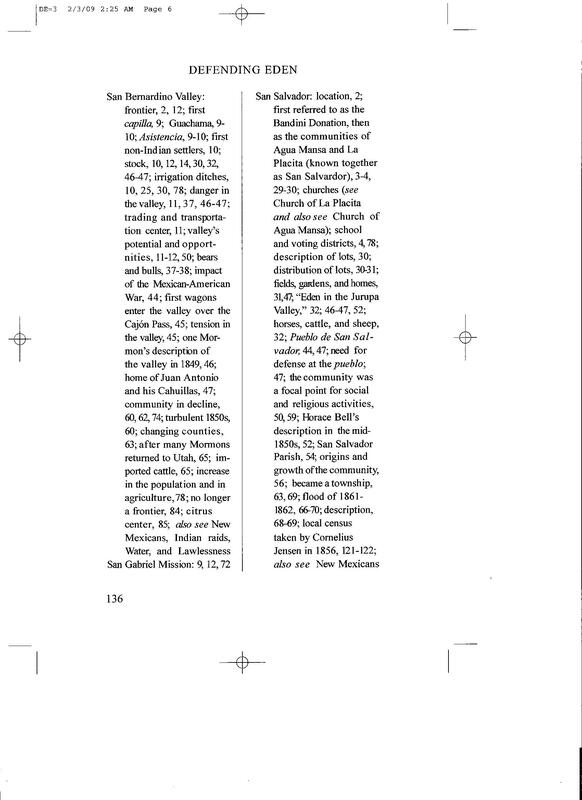 “The New Mexico-California Caravan of 1847-1848.” In New Mexico Historical Review, Volume XVIII, Number 1 (January 1943):1-16. 1967 The American Entrada: A Spanish Point of View, The Frontier Re-examined.” Edited by John Francis McDermott. Urbana, Illinois: University of Illinois Press. The Expeditions of John Charles Frémont. Urbana, Illinois: University of Illinois Press. 1913 “The Elk Mountain Mission.” In Utah Genealogical and Historical Magazine, Vol. 4 (1913):188-200. 1950 “Forgotten Trail of the Old West.” In Desert Magazine, Vol. IXXX (October 1950:19-22. 1948-1949 “Journal of W. C. Powell, April 21, 1871-December 7, 1872.” In Utah Historical Quarterly, Vols. 16-17 (1948-1949):257-478. 1986 “Southern Paiute.” In Handbook of North American Indians: Great Basin. Vol. 11. Warren L. D’Azevedo, volume editor. Washington, D.C.: Smithsonian Institution. 1995 Re-Tracing the Old Spanish Trail, North Branch. Monte Vista, Colorado: Adobe Village Press. 1998a Old Spanish Trail: North Branch, and Its Travelers. Santa Fe, New Mexico: Sunstone Press. 1998b Personal communication to Diane Rhodes and Larry Beal. 1966 The Far Southwest, 1846-1912: A Territorial History. New Haven, Connecticut: Yale University Press. 1999 Telephone conversation with Diane Rhodes and John Conoboy. 1964 I Married a Soldier of Old Days in the Army. 1st Edition. Albiquerque: Horn & Wallace. No date “The Old Spanish Trail.” Typed manuscript, box 220, “Background” file. Gregory C. Crampton Collection, University of Utah Library. 1954 Bent’s Fort. Garden City, New York: Doubleday & Company, Inc.
1930 “The Old Spanish Trail from Santa Fe to California.” M.A. thesis (history). University of California. 1990 Archaeology and Ethnohistory of Antelope Valley and Vicinity. Lancaster, California: Antelope Valley Archaeological Society. 1998 Personal communication to Diane Rhodes. 1999 “From the City of the Saints to the City of the Angels: Early Travel and Freighting From Salt Lake City to Los Angeles.” Unpublished manuscript. November 1999. 1998b “Retracing the Spanish Trail: Across Southern California.” In Spanish Traces, Vol. 4, No.2. fall 1998. Basin. Vol. 11. Warren L. D’Azevedo, volume editor. Washington, D.C.: Smithsonian Institution. 1914 “Texas and the Boundary Issue, 1822-1829.” In The Southwestern Historical Quarterly. Vol. XVII, No. 3 (January 1914):217-261. 1982 People of the Shining Mountains: The Utes of Colorado. Boulder, Colorado: Pruett Publishing Company. 1982 The Valley of Opportunity: A History of West-Central Colorado. Denver, Colorado: Colorado State Office, Bureau of Land Management. The Oregon Question: Essays in Anglo-American Diplomacy and Politics. Cambridge, England: Harvard University Press. 1990 “A Cultural Resources Sample Survey of the Proposed Fort Irwin Land Expansion Area, San Bernardino County, California.” Prepared for the U.S. Army Corps of Engineers. Davis, California: Far Western Anthropological Research Group, Inc.
1976 “The Route of the Domínquez-Escalante Expedition, 1776-77.” A Report of Trail Research Conducted Under the Auspices of the Domínquez-Escalante State/Federal Bicentennial Committee and the Four Corners Regional Commission. Santa Fe, New Mexico: The Commission. 1965 “Frontier Problems in New Mexico Preceding the Mexican War, 1840-1846.” Dissertation, University of New Mexico. Albuquerque, New Mexico. 1924 “History of Jack Stock and Mules in Missouri.” In The Monthly Bulletin, Vol. XXII, No. VIII (August 1924). Jefferson City, Missouri. 1953 Jedediah Smith and the Opening of the West. Lincoln, Nebraska: University of Nebraska Press. 1990 “Archaeology of the Old Spanish Trail/Mormon Road From Las Vegas, Nevada, to the California Border.” In Contributions to the Study of Cultural Resources. Technical Report 17. Las Vegas, Nevada: Bureau of Land Management. 1998 How to Apply the National Register Criteria for Evaluation. National Register Bulletin. Washington DC: National Park Service. 1999 How to Prepare National Historic Landmark Nominations. National Register Bulletin. Washington, DC: National Park Service. 1998 Telephone conversation with Diane Rhodes. 1997 “North Branch of the ‘Old Spanish Trail’ from Touse North to the Winty, 1600-1850.” In Journal of the Western Slope, Vol. 11, no. 4, Fall 1996. “Pipe Spring Arizona, and Thereabouts.” In The Journal of Arizona History, Vol. 6, no. 1, spring 1965. No date. “The Old Spanish Trail Before 1848.” Unpublished manuscript, on file at Utah State Historical Library, Salt Lake City, Utah. 1998 “The Southern Route of the Old Spanish Trail Through Grand and Northern San Juan Counties, Utah.” Manuscript on file Denver Service Center, National Park Service. 1867 The Mule: A Treatise on the Breeding, Training and Uses to Which He May Be Put. Superintendent of the Government Corral, Washington D.C.
1996 “Traders, Travelers, and Horsethieves on the Old Spanish Trail.” In OverlandJournal, Vol. 15, No. 2. Summer 1997:27-41. No date. “Toll Road Through Cajon Pass.” Typed manuscript, box 224, “Cajon Pass” file. Gregory C. Crampton Collection, University of Utah Library, Salt Lake City, Utah. 1997 Explorers, Traders, and Slavers: Forging the Old Spanish Trail, 1678-1850. Salt Lake City, Utah: University of Utah Press. 1999a “The Old Spanish Trail Mosaic: History and Concept,” Spanish Traces, Volume 5, Number 2, Fall 1999, pp 7-20. 1999b “Pipe Springs, Arizona.” Manuscript on file at Denver Service Center, National Park Service. 1998 Routes marked on 7.5′ U.S.G.S. Maps on File at the Denver Service Center, National Park Service, Denver, Colorado; and at the Spanish Colonial Research Center, Albuquerque, New Mexico. 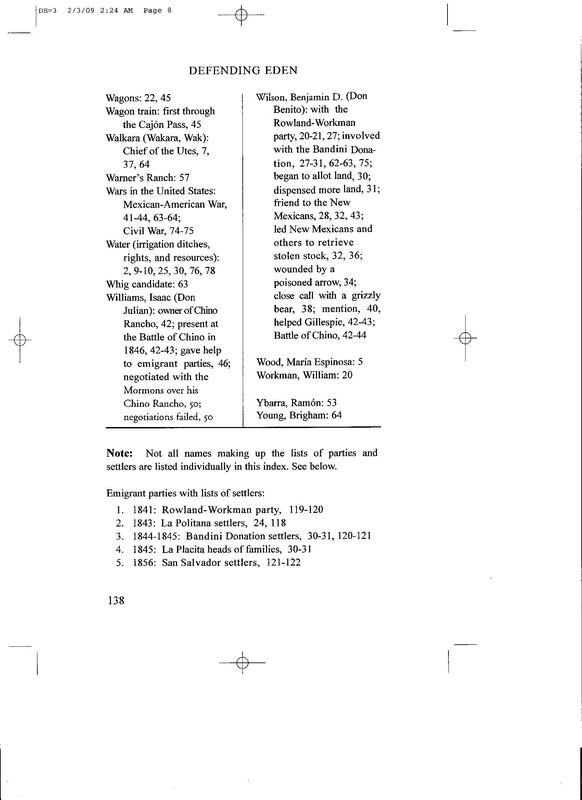 1988 “Indian Servitude in the Southwest.” In Handbook of North American Indians: History of Indian-White Relations, Vol. 4. Wilcomb E. Washburn, volume editor. William C. Sturtevant, general editor. Washington, D.C.”: Smithsonian Institution. 1890 “The Bears’ and the Historians, Part II.” In Overland Monthly and Out West Magazine, Vol. 16, issue 95:531-543. 1935 “A Mormon Mission to California in 1851: From the Diary of Parley Parker Pratt.” In California Historical Society Quarterly, Vol. XIV, No. 1 (March 1935):59-73. 1999 The Old Spanish Trail Across the Mojave Desert: A History and Guide. Las Vegas, Nevada: The Haldor Company. 1962 The California Trail: An Epic with Many Heroes. New York: McGraw-Hill, Inc.
1965 Regional Geomorphology of the United States. New York, New York: John Wiley & Sons, Inc.
1982 The Kit Carson Campaign: The Last Great Navajo War. Norman, Oklahoma: University of Oklahoma Press. 1970 “New Mexico in the 1820’s: The First Administration of Manual Armijo.” Ph.D. dissertation. Albuquerque, New Mexico: University of New Mexico. 1876 Report of the Exploring expedition from Santa Fe, New Mexico, to the Junction of the Grandand Green Rivers of the Great Colorado of the West, in 1859, under the Command of Capt. J. N. Macomb, Corps of Topographical Engineers (Now Colonel of Engineers); with Geological Report by Prof. J. S. Newberry, Geologist of the Expedition. Washington, D.C.: Government Printing Office. 1993 The Plains Across: The Overland Emigrants and the Trans-Mississippi West, 1840-60. Urbana and Chicago, Illinois: University of Illinois Press. 1984 The Indian Frontier of the American West, 1846-1890. Albuquerque, New Mexico: University of New Mexico Press. 1928 Kit Carson: The Happy Warrior of the Old West. Boston and New York: Houghton Mifflin Co.
1930 Overland with Kit Carson: A Narrative of the Old Spanish Trail in ’48, by George Douglas Brewerton. New York, New York: Coward-McCann, Inc.
1986 Back Door to California: The Story of the Mojave River Trail. Patricia Jernigan Keeling, Editor. Barstow, California: Mojave River Valley Museum Association. 1974 “Armijo’s Trace Revisited: A New Interpretation of the Impact of the Antonio Armijo Route of 1829-1830 on the Development of the Old Spanish Trail.” M.A. thesis, University of Nevada at Las Vegas. 1981 Cultural Resources of the California Desert, 1776-1980: Historic Trails and Wagon Roads. Spanish translation and interpretation by Elizabeth Nelson Patrick. Riverside, California: Bureau of Land Management, California Desert Office. 1988 Handbook of North American Indians: History of Indian-White Relations. Vol.4. Wilcomb E. Washburn, Volume Editor. William C. Sturtevant, general editor. Washington, D.C.: Smithsonian Institution. 1971 The Taos Trappers: The Fur Trade in the Far Southwest, 1540-1846. Norman, Oklahoma: University of Oklahoma Press. 1982 The Mexican Frontier, 1821-1846. Albuquerque, New Mexico: University of New Mexico Press. 1988 Myth and the History of the Hispanic Southwest. Albuquerque, New Mexico: University of New Mexico Press. 1883 U.S. Geographical Surveys West of the 100th Meridian, Parts of Southern California. Atlas Sheet No. 73. Washington, D.C.: Government Printing Office. 1991 It’s Your Misfortune and None of My Own: A New History of the American West. Norman, Oklahoma: University of Oklahoma Press. 1972 Jim Beckwourth: Black Mountain Man, War Chief of the Crows, Trader, Trapper, Explorer, Frontiersman, Guide, Scout, Interpreter, Adventurer, and Gaudy Liar. Norman, Oklahoma: University of Oklahoma Press. 1978 “Westward Ho–In ’49: Memoirs of Captain Thomas S. Wylly.” In The Pacific Historian, Vol. 22, No. 1 (spring 1978):71-96; No. 2 (summer 1978):120-144; No. 3 (fall 1978):274-295; No. 4 (winter 1978):327-352). The exhibition focuses on the history of slavery and its impact upon Ute and New Mexican Hispanic communities. Organizers of the exhibition hope to affect a deep, narrow and sustained commemoration of the past, all at the heart of understanding how captivity slavery profoundly affected communities. Read the Captive Communities concept design draft which includes many research bibliographies. This history of the settlement of Agua Mansa and La Placita on the Santa Ana River in Riverside, California, provides many details of San Bernardino Valley history. It complements the Beattie’s book cited above. Emigrants from Abiquiu, New Mexico, settled in the Valley at the request of rancho owners. Abiquiu residents were experienced in defending against Indian raids and some were enticed with grants of lands to move west to defend the Valley. This history makes very clear their vital contribution to the settlement of southern California. The book helps to establish and clarify the role of the OST in supporting westward migration to California. 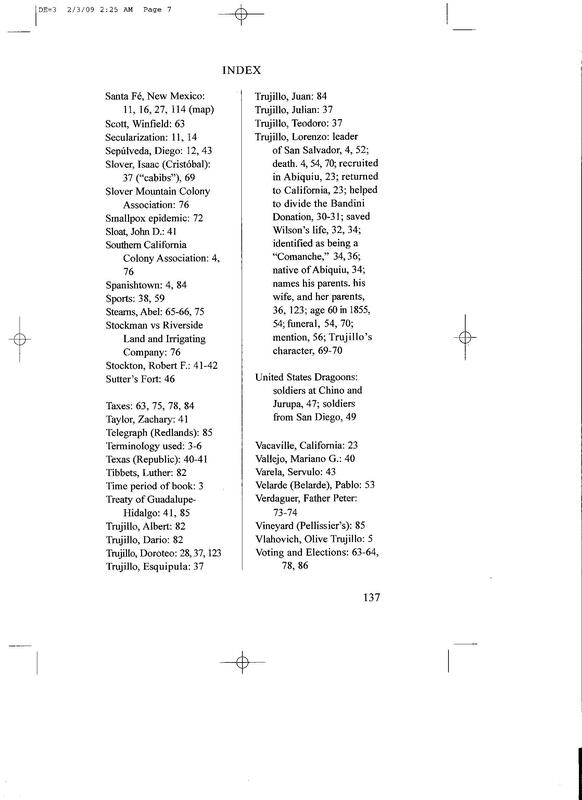 The book lacked an index and so one is provided here courtesy of Mary Haggland.